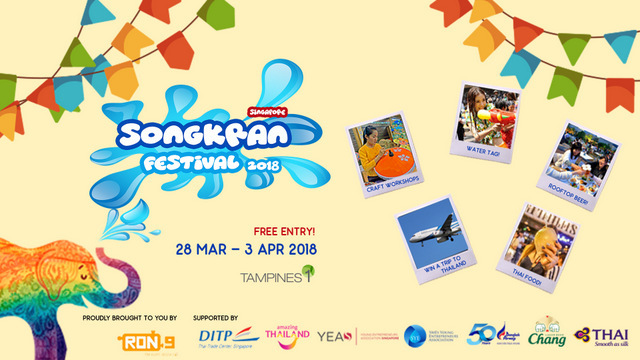 From 28 March to 3 April 2018, the Singapore Songkran Festival 2018 will be held at the main atrium of Tampines 1 in Singapore. Experience authentic Thai culture in the heartlands through the week-long Songkran-themed event. There will be water game booths, a water laser tag game for children on the rooftop, and 40 local and Thai vendors offering a spread of food, fun and fashion. Take photos at the Tuk Tuk pop up in Level 1 and the Wall of Smiles photobooth on the rooftop. Enjoy performances at night by Thai singer Derek Ruj, cultural performance and traditional Thai handicraft sessions such as leaf-folding, egg painting, jewellery making and Thai umbrella painting. In the evening, enjoy Chang Beer at the alfresco beer garden. Stand a chance to win prizes including a pair of return tickets to Ko Samui and Bangkok sponsored by Bangkok Airways and Thai Airways. The festival is presented by Ron 9 Pte Ltd, a new and dynamic event ideator comprising six Singaporeans with NUS Law Undergrad Lay Chang Yao being the youngest at 22 years old. Ron 9 Pte Ltd has the ability to showcase and bring to Singapore SMEs, young entrepreneurs, cottage industries and artisan creators of lifestyle products from all over the world while working Young Entrepreneurs Association of Singapore, SGP Business Federation and embassies and foreign government agencies.